Today we’re doing a different kind of math. 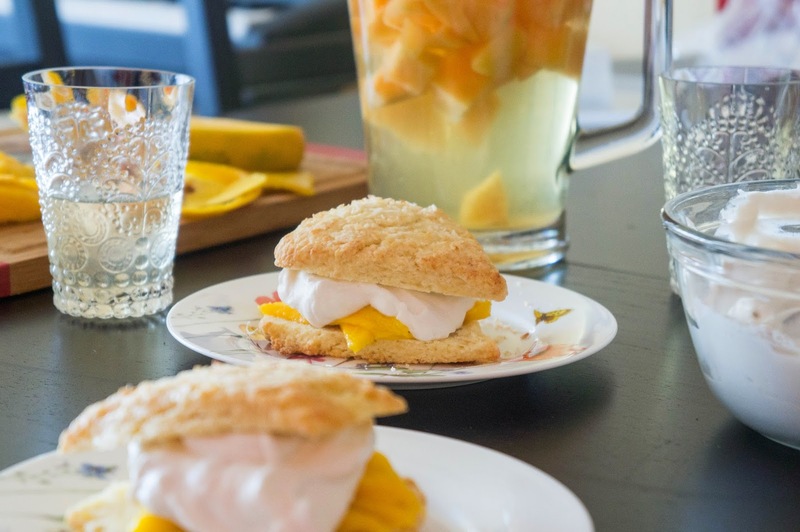 These dreamy, tropical pastries are essentially strawberry shortcakes, but we’ve added coconut flaked to the scones, replaced the strawberries with mango, and added coconut cream to the whipped cream. 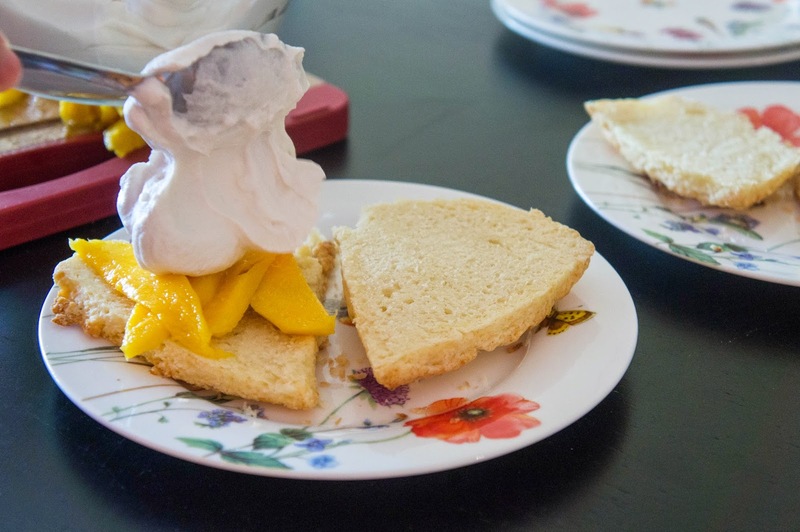 The ripe, juicy mango and luscious coconut whipped cream moisten the scone base. Each bite is creamy and not too sweet. 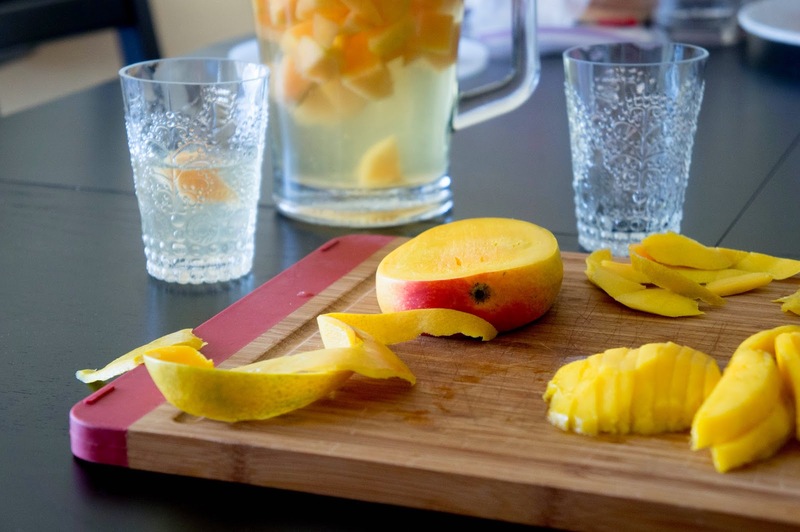 Serve in full sunshine with a pitcher of melon sangria (recipe soon!) and you’ve created your own island paradise. Preheat the oven to 375F and line a baking sheet with parchment paper or a baking mat. In a large bowl, whisk together flour, sugar, baking powder, and salt. Cut the butter into small pieces and work them into the dry ingredients with a pastry cutter or your fingers, until the mixture resembles coarse crumbs. In a small bowl, whisk the egg lightly. Add vanilla and cream and stir together. Dump all the liquid into the coarse crumbs and stir gently with a fork until the mixture just comes together into a dough. Gather together with your hands into a ball. Do not overwork the dough or it will lose its lightness and bake up hard. On a lightly floured surface, pat the dough out gently until it is about 1 inch thick. Now you can cut rounds out using a biscuit cutter, or do what I did and cut it directly into triangles. Place ready cut dough onto your prepared baking sheet. 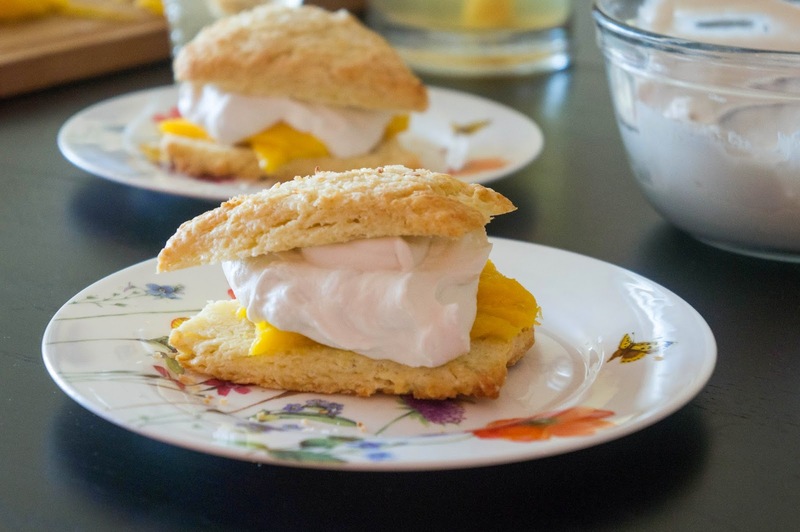 Brush the tops of the scones with a little heavy cream. This will help them brown nicely. Sprinkle the tops with coconut. Bake at 375F in the middle of the preheated oven for 17-20 minutes, or until nicely browned on top and a toothpick inserted in the center comes out clean. Transfer to a wire rack to cool. Scones can be stored in an airtight container lined with paper towel for up to 3 days, but best served the day they are made. I like to mix the coconut cream with whipping cream to make it a little more luscious, but if you like whipped coconut cream on its own, by all means leave the whipping cream out. It’s also important to know your coconut milk. There are some brands that have stabilizers in them and won’t separate no matter how long you refrigerate them for. I find Thai Kitchen brand separates nicely. Without shaking it, open the can of coconut milk. Scoop out all the cream from the top into a bowl, leaving the water behind. Whisk the cream until smooth and thick. In another bowl, whisk the whipping cream, sugar, and vanilla to firm peaks. Fold the whipped cream into the coconut cream. 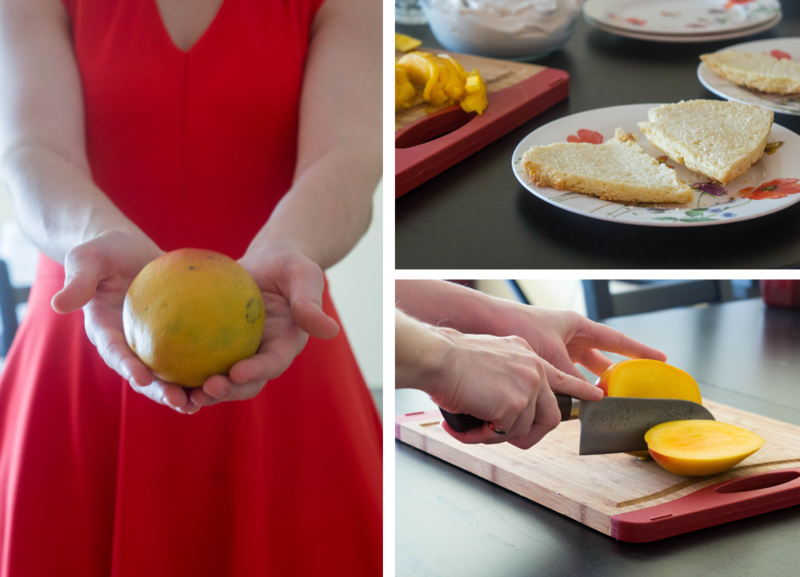 Slice a scone in half and line with sliced mango. Top with coconut cream and the other half of the scone. Eat immediately.